Samir Wahid is the young man who owns Gift Republic Limited and 26 other domains, the largest of which is framedshare.com which will frame a share certificate for you – select from 10,000. This is probably the best website of our group, but the merchandise is sad. Name a Star, Name a Rose, Adopt a Vine, Penguin, Meercat, Polar Bear, Shark, Hedgerow, etc etc. A purchase from Gift Republic is clearly in the class of “A bit of fun” and is not meant to be taken seriously. 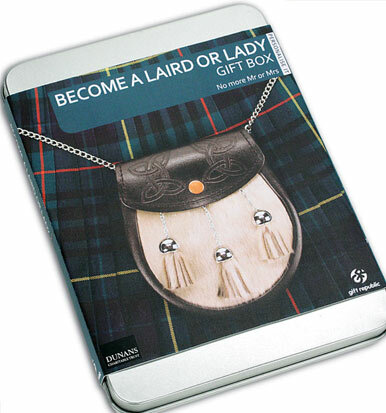 The “Become a Laird Gift Box”, at £25, is a little silver tin containing a few sheets of printed matter. The documents are not personalised, but customers have the opportunity to register in order to receive a personalised land ownership certificate and a Proof of Title card. It is claimed that “Your gift will help in the restoration of Dunans Castle and grounds” but no indication is made of how much will go for this purpose. If you are looking for a gag gift for Granny that can be easily wrapped and soon forgotten, then this would be our top choice. The contents of the tin are professionally printed, though somewhat bland. Despite the excellent website, customer service was very slow. Two days after we sent our email, we received a reply from Janet. She confirmed that plots were not defined by Ordnance Survey or GPS coordinates, but said that we would get a plot number and there was a grid at the land which would help us stand on our plot. No returns would be considered if we were dissatisfied and a few themed sweatshirts were available once we had made our purchase. A payment option of Barclaycard in addition to PayPal is reassuring and only to be expected with a merchant as large as this. an A5 page of history of Dunans Castle and another A5 page “Your Gift Explained”. Another piece of paper explains how to register your plot as a Laird or Lady (no Lord option) . Finally there is a rather generic welcome letter from Gift Republic. The major irritation is the absence of personalisation which rather makes the whole thing fall flat. If we had purchased the tin from a shop, this would be unavoidable, but supplying the paperwork unpersonalised when purchased on the internet seems very sloppy. Several of their competitors manage it, so there is really no excuse. Other than that the product is slick, well printed on good quality paper and has a very professional air about it. Much is made about restoring Dunans Castle, not really a castle but an old house which the owners, the Dixon-Spains, would like you to restore for them. This gives the whole concept of purchasing a lairdship a new twist. Other schemes promise to conserve the environment, but nobody else asks you to maintain their house! Through their http://scottishlaird.com website, packages start at a modest £24 and progress to an eye-watering £455. There is a modest range of CafePress accessories, jewelry, stationery, posters and a tartan. They claim that half of their income will be spent on repairs to the castle and the bridge, through the Dunans Charitable Trust. But this claim is proved bogus, because the Scottish Charity Register reports a 2012 spend of only £250 from an income of £750. Spending since then has been NIL. In April 2016 this “bogus charity” was finally struck off the register. The bridge remains “at risk“. Where the money raised has gone is unknown. The vague claims by other vendors to do some good may be hard to judge. The Dixon-Spains leave themselves wide open to cries of “fake” by actually publishing the figures. Other than that, this is a well thought out offering and would make a great gift for anyone. The chance to visit the castle and have a free look round is also a plus. I love the idea of this: buy a parcel of land and acquire a nifty title. It’s a fabulous idea if you like giving “gimmick” gifts, or if you need a gift for the kind of person who is hard to shop for. The product arrived in a gift tin (as pictured) that was nice and sturdy. I was afraid it would feel cheap and flimsy. The actual contents of the tin were disappointing. All of the included papers, save the large photograph, were printed on cheap, thin paper that seemed little better than newspaper grade. The informative “booklet” was nothing but a tri-fold pamphlet on the same sort of paper. I can’t complain too much about that; after all, the product was inexpensive, and the proceeds are meant to fund the restoration of the castle. It’s only natural that they would want to maximize the amount of money that can actually be used for that purpose by minimizing the cost to actually make this product. In the long run, though, I would have preferred to pay a higher price and acquire a higher quality product. Thick, glossy paper or something equally sturdy would have been much nicer, especially if you are giving this product as a gift. Overall, I am pleased with my purchase, and the recipient of the gift was delighted. It does have its downsides, but I don’t feel that they are bad enough to negate the otherwise unusual nature of this product. Gift Republic have lots of rather naff gifts. I recommend that you look at the people at Highland Titles. I bought this gift and was very happy with it for £30 it seemed a bargain to me and the recipient was also very happy. My wife bought a ‘Laird’ title for me as a novel Valentines gift. It gave me a chuckle, the Dunans web site is very good, they reply to e-mails and have some great accessories. Just purchased the ‘Rising Tartan’ tie. No complaints here. I think she bought it with a Groupon voucher so it worked out about £12 for the gift.